Vice Admiral Calhoun was a good friend of Dad's during the war, ever since the incident with the Admiral's war room door. Calhoun held an important post in the Pacific war effort, so he must have been a competent officer or he'd have been replaced. But personally, he appears to have been more than a little eccentric! Senile, as Dad puts it. My reference says that Admiral Calhoun was "[t]he premier logistics commander of the war in the Pacific." When my father heard that description, his comment was "He must have had a cracker-jack staff!" Since we're mainly interested in ADM Calhoun during WWII, I'll be brief on his career up to that time. Graduated 13th in a class of 116 from the US Naval Academy in 1906. 1913-1915: Inspecting ordnance and instructing naval militia in the Connecticut area. 1915-1917: Training in, serving on, and fitting out submarines and monitors: Columbia (C-12), Tonopah (BM-8), Cheyenne (BM-10), and the submarine L-7 (SS-46). 1917: Inspecting naval machinery contractors in the Los Angles and San Francisco area. Instructing naval militia in LA and Santa Barbara. Commanded the militia training ship Farragut (TB-11). 1918: Commanded Submarine Flotilla One, Atlantic War Zone. Also took over the sub base and naval air station in the Panama Canal Zone. 1919: Became the award winning gunnery officer on the Mississippi (BB-41). 1923-1925: Attached to the destroyer tender Melville (AD-2) and the battership Maryland (BB-46). 1925-1927: Mare Island ordnance inspector, again. 1927-1929: As commander of Destroyer Division 31, pennant aboard Farragut (DD-300), he won efficiency awards in both oceans. 1929-1930: Took the senior course at the Naval War College, and headed the Navigation Department and the Naval Academy. 1932-1933: Captain Calhoun commanded the old armored cruiser Rochester (ACR-2) in cruise with the Yangtze Patrol. 1937: Briefly commanding officer of the California (BB-44). 1938: Chief of Staff to Commander Battleships. Promoted to Rear Admiral. "Admiral Calhoun, after attending the advanced course at the Naval War college, in December 1939 became Commander Base Force, U.S. Fleet (changed to Base Force, Pacific Fleet, in February 1941), with additional duty from August 1941 as Commander Train Squadron Two. 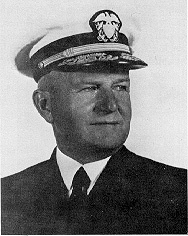 With the beginning of hostilities in the Pacific, he became Command Service Force Pacific Fleet in the rank of vice admiral and in which capacity he successfully directed, from Pearl Harbor, the entire logistics effort (except for aviation) in the war against Japan, including the revolutionary and crucial at-sea replenishment squadrons. In March 1945 Calhoun transferred to command the backwater south Pacific Area, the logistics of which he had personally established during the trying Guadalcanal campaign of late 1942. Relieved in October, he spent several months as Inspector General of the Navy and then General Inspector of the Western Sea Frontier, retiring in April 1946. He was advanced to full admiral in January 1954." Oh, yes. Much later, about 1960, we found that our neighbor's brother (also an admiral) had known, or known of, Admiral Calhoun. ADM Beardall said that Calhoun also had the nickname of "Windy Bill." From Dad's descriptions, it fits!